Gold a yellow shining metal is back in action again. Gold Price is increasing since beginning of year 2016. It is perhaps best start for the Gold in last decades. Gold has beaten almost all asset class including equity and mutual funds in past three months. You might be surprised that from January, 2016 gold has given return of 22% to the investor. In January 2016 gold price was Rs 2250 per gm and today gold price is Rs 2750 per gm. This is mainly due to rise in gold price in the international market. Gold Price has touched 15 months high $1300 an ounce in the international market. The main reason behind sudden increase in gold price is uncertainties in equity market and variation in dollar value. Gold will beat all other asset class in 2016? Is it a correct time to invest in gold? Will the upwards trend of the gold price continue in 2016 and beyond? What we can expect from gold in 2016 and following years? Well, it is extremely difficult to answer these question precisely. However, based on various data and information available from the internet let’s try to find out Gold Price Prospective for 2016 and beyond. Fundamental of economic says that if we want to find out price of anything, we should look at supply and demand. Same is true even for gold. When demand of gold is growing and supply is less gold price is expected to grow. Supply and Demand is one of the key factors in deciding the price of Gold. Following factors are responsible for affect in demand of gold. Central Bank and other banks are continuously buying gold. Physical demand for gold from world’s biggest consumer India is growing. Recently we have observed 41 days’ strike by jewelers in India to oppose excise duty on non-silver jewelry. The resumption in business has boosted demand of jewelry partially. Demand of Gold is picking up due to festival and upcoming marriage season. This year it is expected to be year of good monsoon. Good monsoon is intended to put more money in the hand of villagers and farmers. As gold is preferred option by them, they may end up investing this money in Gold. Another good reason for growth in gold demand is 7th Pay Salary Hike. Employee benefited from 7th Pay is likely to invest partially in gold and it may cause increase in gold Demand. Gold Price also depends on dollar price. Recently it is observed that US Dollar has weaken against the world. Dollar price has a direct relation with gold price. As the dollar is going down, the dollar price of gold is going up. The price variation of the dollar will decide price of gold in future. Economy and Gold price has inverse relationship with each other. As and when economy goes down investor tries to protect their capital and make investment in the gold. As a result, demand for gold grows and it will increase gold price. So, another big factor which will decide gold price in 2016 and beyond is economy. Global economy might face trouble in 2016 mainly due to slow growth of USA and weaken Chinese economy. So, we can expect gold in green zone. Gold is considered as a safe haven in uncertain times. Looking at health of global economy it is expected that gold price will soar further in 2016. Increase in the demand of gold in domestic market is another driving factor behind increase in gold price. Dollar value is likely to ease further due to liquidity in market and it may affect gold price. Gold price in Indian market has reached to Rs 30,000 per 10gm today. Gold price may reach to Rs 32000- 32,500 in short time and It may touch Rs 35,000 in one year. All factors say that gold will remain in green zone. However, we may see downturn in gold price and it may tumble by Rs.3000. If you are holding sufficient gold in your portfolio you should retain your investment. If you are yet to begin investment in the gold you should plan your investment using SIP route. It is better to make investment through Gold ETF or in Government’s Sovereign Gold Bond Scheme. 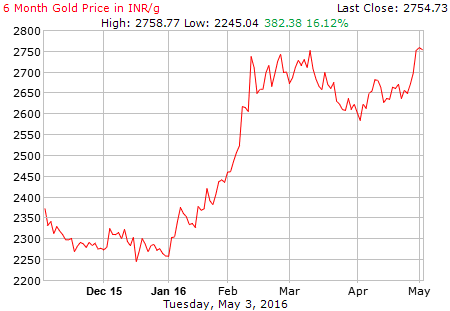 Do you think gold price will increase in 2016? 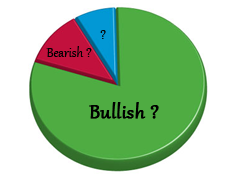 Do you think gold will be new investment bet for 2016?